Denny Jump (Bellevue, WA, United States) on 15 September 2011 in Landscape & Rural and Portfolio. Calmness and reflection are key ingredients of a peaceful heart. 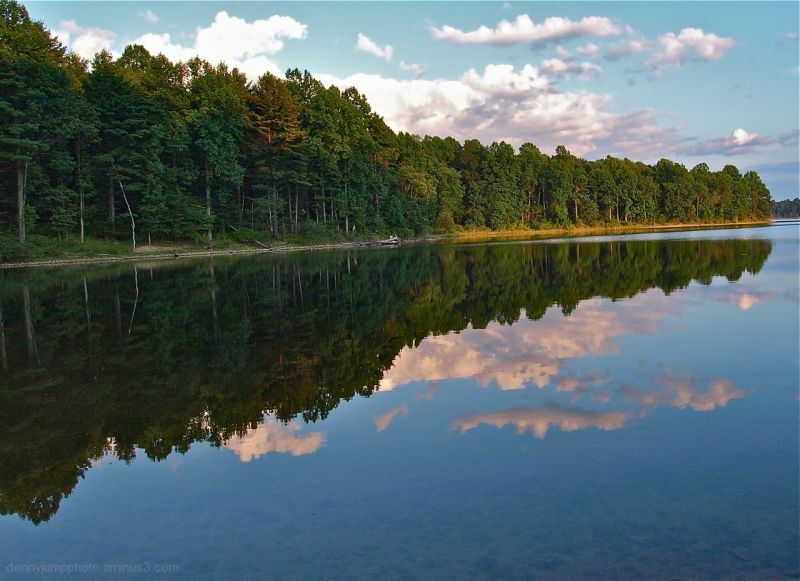 This image was captured at Merrill Creek Reservoir, Warren County, New Jersey - Summer, 2010. Sure looks mighty peaceful but be assured gravity is still hard at work and there is molecular excitement where those tree roots reach out toward the water and a constant spray of friendly photons coming in from top right ! But breathing is ok, Denny, coz it feeds those clouds as well as the heart. All that's missing is few birds singing and the smell of a fresly cut grass. Truly wonderful view and great reflections. Glorious image, Denny - the reflection is so perfect it is hard to tell which side is up or down! As you suggest, a perfect place to peacefully reflect on our own image as well. @Stephen: Hi Stephen - Thank you so much ;-) I always love your water images - they are fantastic . All the best! @B. Thomas: Hi Barbara - Thank you very much - Yes I really was taken by the smoothness of the water and the reflections that evening..this was in the summer actually around 7:30 or so..Thanks Again -0 I love your image today!! A wonderfully peaceful shot Denny. Beautiful softness in this sharp reflection. wonderful calm location with beautiful reflections on the water! Serene, tranquil and pristine. Nicely captures Denny, and thank you for posting this. It kinda' puts it all into proper perspective. Gorgeous, crisp landscape. The composition of the trees and their reflections is excellent. This and the wonderful colors really transmit calm and well-being. Great image, Denny. @Francisco Romero: Hi Francisco - Wow thanks very much! Very kind of you...All the best! Such a beautiful and tranquil feeling that you've captured perfectly here Denny. That reflection is just gorgeous - excellent shot! Beautifully composed and captured! The reflections are stunningly crisp in detail. @Steven: Hi Steven - Thank you very much...it was beautiful that evening for sure! Ah yes, I needed a reminder to take a deep and peaceful breath. What a soothing scene. Delicious. @DULCIE: Glad you like it Dulcie - I really enjoy all of your work - it is so refreshing and masterful!..Thanks again! Beautiful scenery and georgous colorful detailed reflection, so peaceful, Great capture and place! Have a nice day! Cracking great image Denny, a perfect exposure and very neat composition, they don't come much better than this. @franz: Hi Franz - I appreciate your kind comment - I plan to revisit if the season unfolds nicely..we are not sure yet due to the mixture of extremely hot weather- which killed many leaves, followed by torrential rains which over watered everything such that they may simply turn brown and fall (like an over watered houseplant)Time will tell. Thanks again sir! I like the great light in this picture. @Gérard Beullac: Hi Gerard - Thank you very much...I see your image for today is on the lake too and it is absolutely beautiful Gerard - I love it! Thank you for you very kind comment to me here :-) All the BEst! @Richard: Hi Richard ;-) Well, thank you very much...What a wonderful thing to say! You know, the funny thing about this image - I captured this way LAST summer (2010) and I worked with it a bit - not so much processing but cropping...I could not get it balanced just right - the original had too much sky...I finally got it ok but I was still not entirely happy ...so I just let it "sit." Then, a few days ago I was looking through this group and I came upon this one...I .decided "well, hell, this one's not so bad, reallyy!" So I decided to post it! Amazing what a little "time in the cellar" can do for a bottle of wine as wel as the owner ;-) Have a great day tomorrow sir! Wonderfully peaceful! I love the reflections. Yeah... I love these kinds of shots, with crystalline reflections in the water. Those clouds look fantastic in both the sky and reflection, too. This is absolutely gorgeous! Beautiful reflection. It is so serene and peaceful. I wish I had the chance to look at it earlier today (because I had a really bad day) and this would have given me an escape! Ah, Denny! Thanks for the reminder to breathe. Looking at this serene scene, one has to breathe deep and slow, and meditate on the scene. It is pure peace and love. So well composed, and just beautiful! We often forget to breathe ..........thanks to remind it with this peaceful picture . Great scene here Denny...I like the reflected elements in this compositon...Have a great weekend.